To review this week . . . Prime Minister Putin’s current deadline for completing GOZ contracts is August 31, but it’s unlikely to be met, even by loyal Deputy PM and OSK Board Chairman Igor Sechin. Deputy Finance Minister Siluanov said Defense Ministry contracts are being made on credits and government-backed financing rather than cash. Putin said the price tag for GOZ-2011 is 750 billion rubles, but 30 percent of projected procurement still isn’t covered by contracts as the final third of the year begins. How did the government, Defense Ministry, and OPK arrive at an August 31 deadline that’s unlikely to be met? The latest round of this year’s GOZ woes started in early July when MIT General Designer Yuriy Solomonov told Kommersant that GOZ-2011 was already broken, and Russia’s strategic missile inventory is not being renewed as necessary. He said there’s no contract for the RS-24 / Yars ICBM, and the late arrival of money makes it impossible to salvage 2011. RIA Novosti reported Serdyukov’s opinion on the “wild growth” in the price of military products, especially from MIT and Sevmash. He said MIT is asking 3.9 billion and 5.6 billion rubles respectively for Topol-M and Yars ICBMs. Serdyukov put GOZ-2011 at 581 billion rubles [different from Putin’s figure! ], and added that only 108 billion, or 18.5 percent, was not yet under contract. He said everything would be done in 10 days. At virtually the same time, Deputy PM and VPK Chairman, Sergey Ivanov told ITAR-TASS 230 billion rubles were not yet contracted out. OSK piled on Serdyukov, claiming contracts for 40 percent of the Navy’s share of the GOZ weren’t finalized. In late July, it looked like Northern Wharf (which reportedly produces 75 percent of Russia’s surface ships, and is not part of OSK) might be made into an example for other “GOZ breakers.” While prosecutors talked vaguely about the misuse of GOZ money, the shipbuilder’s representatives apparently mounted a vigorous defense, asserting that the enterprise has been right on time, even though it’s underfinanced by the Defense Ministry. Main Military Prosecutor Sergey Fridinskiy said prosecutors uncovered 1,500 GOZ-related legal violations during the preceding 18 months. He indicated there were 30 criminal convictions, and state losses amounted to millions of rubles in these cases. The most egregious example was the theft of over 260 million rubles given to OSK’s Zvezdochka shipyard to repair Kirov-class CGN Petr Velikiy. Fridinskiy indicated the enterprise director and his close associates apparently had 40 million of the money in their own names. Recall Fridinskiy earlier said 20 percent of defense procurement funding is stolen. According to Rossiyskaya gazeta, Defense Minister Serdyukov claimed he was on the verge of signing contracts with MIT for Topol-M and Yars production. Once again, he said all contracting would be finished in two weeks. In mid-August, OSK enterprises Sevmash, Admiralty Wharves, and Zvezdochka said they would soon be forced to cease work unless the Defense Ministry signed contracts with them. Putin, Sechin, and Serdyukov met and launched a special interdepartmental commission to set prices for the Navy’s remaining 40 billion rubles in GOZ contracts. And, according to Kommersant, everyone was once again reassured that all contracts would be completed in two weeks. And it’s not just all ICBMs, ships, and submarines . . . Kommersant wrote that the Defense Ministry eschewed contracts for 24 or more MiG-29K and more than 60 Yak-130 trainers at MAKS-2011. So what does the mid-year GOZ picture look like? The president and prime minister have fumed and set a series of deadlines, not met thus far. And the defense minister and deputy prime ministers have assured them they would meet each deadline in turn. More interesting, and somewhat unnoticed, is the fact that the prime minister and defense minister (among others) seem to be consistently working from different sets of numbers on the size of the GOZ, and how much has been placed under contract. The GOZ hasn’t captured this kind of leadership attention at any time in the past 20 years. Producers are being honest when they say late state contracts mean they can’t do anything (or at least what the Defense Ministry wants them to) in what remains of the year. Picking up the pieces of GOZ-2011, and trying to put GOZ-2012 on a better footing will occupy the rest of this year. Lost in everything is what will the Russian military get eventually by way of new hardware, and when will they get it? And how good will it be? So much has swirled around the state defense order (Gosoboronzakaz or GOZ) this year that it makes one avoid the topic. But here’s a shot at making amends for neglecting it. Perhaps this information will just precede the next wave of GOZ news, likely to break before the end of August. The current deadline for putting out GOZ contracts is August 31 (who knows when the weapons and other military equipment being bought will actually be delivered?). You may recall Prime Minister Vladimir Putin set August 31 as the most recent “last deadline” for placing all GOZ-2011 contracts back in late July. At that time, Putin pretty much put all blame on the Defense Ministry. Defense Minister Serdyukov said he would complete the contracting, and report to the President and Prime Minister by the deadline. The report is supposed to be a joint one reflecting the positions of all players involved in the GOZ. This very day, BFM.ru reports that Deputy PM Igor Sechin says he’ll be two more weeks negotiating OSK shipbuilding contracts with the Defense Ministry. He claims three of 13 remaining contracts are being signed today. Prices for the remaining ten will apparently be specified and agreed over the next 14 days. According to ITAR-TASS, a VPK source indicated the Defense Ministry still needs to contract with Sevmash for delivery of one Proyekt 885 (Yasen-class) and two Proyekt 955 (Borey-class) submarines this year. The source said work continues despite the lack of a signed contract. ARMS-TASS, however, provided the best insight into the current state of play on the GOZ. The news agency cited Deputy Finance Minister Anton Siluanov on a Putin-led government conference on the GOZ early this week. Siluanov concluded the Defense Ministry will soon sign its contracts and send out advance payments. Additionally, he criticized the delays for “breaking budgetary discipline,” and added that defense contracts are being signed on credit schemes and state guarantee mechanisms [i.e. not cash]. There’s quite a lot in those statements. Probably as much substantive as Putin’s said publicly about GOZ problems. Tomorrow we’ll do Part II on the latest woes. Then maybe we’ll look at 2011 — the year of the GOZ. And possibly even a look at the GOZ since 2000 or so. Does That Box Come With Electronics? The latest Mistral story is more complex than what you’ve probably read so far. Russian press services report a highly-placed military source claims Paris has “registered” Moscow’s demand for systems and equipment on Mistral that fully satisfy the Russian Navy’s requirements. Media sources also say the negotiations foresee a state contract for the provision of two Mistrals, spare parts, instrumentation, and essential operator documentation, as well as equipment, services, and construction documentation needed to build two more Mistrals in Russia. A source also told the wire services preparation for the acquisition of Mistral “is going logically and systematically” within the bounds of the negotiating process with the French side. Newsru.com, by contrast, claims this is the Defense Ministry’s way of countering reports that Moscow has decided not to buy Mistral since France is trying sell Russia “empty boxes” for a billion euros. Newsru is referring to Vedomosti’s story from earlier this week saying the entire Mistral deal is under threat because the ships’ outfitting is unacceptable to Russia since it doesn’t include modern command, control, and communications systems, and is only a “basic variant” of the ship, a “box without electronics” essentially. On the issue of providing C3 systems (specifically, Senit 9 and SIC-21) on-board Mistral, Vedomosti implies it’s more about money than technology transfer. Russia can either pay an extra 200 million euros for a full electronics fit, or try to argue at the political level for the ships at the price of 890 million euros which was supposedly on the protocol signed late last year by now-retired Vice-Admiral Nikolay Borisov and Deputy PM Igor Sechin. Other sources have said Borisov and Sechin exceeded their mandate in agreeing to a price well over 1 billion euros. We don’t really know what was on that protocol. The point – overlooked by many including yours truly – is that there’s no real contract for Mistral yet, and it’s a long way off. All there are so far are protocols, agreements, and understandings. What was signed in January at Saint-Nazaire was an “intergovernmental agreement” for the possible construction of two Mistrals, not a specific contract covering that and the construction of two more in Russia. Wednesday Interfaks.ru ran its review of the Mistral story concluding that the negotiating process is difficult, but the French have decided to meet Russia’s requirements. A professional diplomat and negotiator is never going to say a process is easy, and this one isn’t. But it does sound like there’s a draft contract, while price and exactly what the presidents agreed remains at issue. Let’s review recent play in Russia’s possible purchase of French Mistral amphibious ships. In yesterday’s Nezavisimaya gazeta, Viktor Litovkin said, despite reports Russian-French negotiations are going well, Russia’s announcement of an international tender for construction of large amphibious ships disrupted their exclusive talks. But Litovkin thinks Russia will ultimately buy Mistral because (he believes) President Medvedev has promised French President Sarkozy. So, the tender is really only about where to build two Russian-made ships (units 3 and 4), and the answer is Kaliningrad’s Yantar shipyard, according to Litovkin. 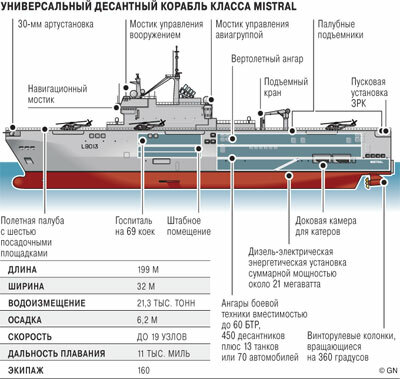 To Litovkin, the remaining issues are the electronic fit on Mistral, and the final price of the deal. He goes back to General Staff Chief Makarov’s comment that the Russian ships will be exactly like the French ones, down to their comms systems. The only exception being Russian ones won’t have codes linking French ships into NATO’s command and control network. On 9 September, Nezavisimaya gazeta picked up on a Le Figaro article concluding that Russia’s tender, coming after six months of negotiations with France, signified trouble. It wrote that there is more than a little question whether they will remain exclusive talks, even if they continue. Technology transfer in the Mistral deal is Moscow’s sine qua non, but this issue may not be resolved on the French side. Le Figaro believes the U.S. may be able to restrict the export of American-made electronic equipment on Mistral. Also on 9 September, Rossiyskaya gazeta wrote that cost is the main unresolved issue in Moscow’s negotiations with Paris. The paper also focused on the Defense Ministry’s insistence on receiving technologies, not just weapons systems and platforms from abroad. Also from 8 September, Newsru.com reported Serdyukov saying “we are now waiting on a price” from the French. He apparently said the French offer would be evaluated with the help of both Russian and foreign experts. After Serdyukov’s tender announcement, Sarkozy dispatched his military adviser, and former DRM chief, Benoit Puga to meet with Russian Deputy Prime Minister Igor Sechin on 26 August. Of course, Sechin is Chairman of Russia’s United Shipbuilding Corporation and point man in dealing with the French on Mistral. They met at Yantar in Kaliningrad. Puga reportedly told Sechin that ‘2+2’ was acceptable; the first Mistral would be built in a French shipyard in 36 months, the second following 12 months after. And the third and fourth would be built in a Russian yard. The French have stayed fairly confident in public about winning the contract. And most Russian defense commentators still see Mistral as the favorite even if there is competitive bidding for the work. Kommersant reports today that United Shipbuilding Corporation (OSK) has gotten the Defense Ministry’s permission to hold an open tender for procurement of helicopter carriers. The paper concludes the Defense Ministry is refraining from a sole-source purchase of the French Mistral, and will consider similar proposals from OSK’s shipyards. But the military [at least some military officials] haven’t hidden the fact that they prefer Mistral [but Defense Minister Serdyukov has always maintained they’ve been talking to other suppliers], so the tender could just be a formality. OSK President Roman Trotsenko says a special commission from the Ministry of Industry and Trade will conduct the tender, but details are sketchy. A Defense Ministry source told Kommersant that, without a tender, a deal to buy a helicopter carrier [presumably Mistral] would be considered illegal. So there won’t be a sole-source buy despite a year of government-to-government talks. The paper reminds readers of OSK’s recent unsuccessful antimonopoly complaint in regard to the government’s consideration of Mistral. Although the complaint was not reviewed, it must have had some impact on the decision to compete the helicopter carrier purchase. Kommersant sources say OSK Board Chairman Igor Sechin also had something to do with it. Trotsenko says far east shipbuilding plant ‘Zvezda,’ Petersburg’s ‘Admiralty Wharves,’ and Kaliningrad’s ‘Yantar’ will bid for the ships. 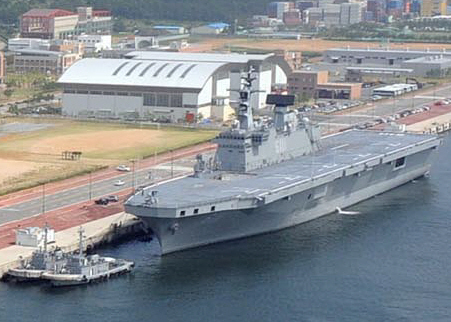 ‘Zvezda’ already has a joint venture in place with South Korea’s Daewoo – builder of the Dokdo helicopter carrier. The OSK President says ‘Admiralty’ and ‘Yantar’ might work with ‘Northern’ shipyard or a foreign builder. Kommersant has a letter sent from Sechin to Prime Minister Putin this spring saying not only is Dokdo an alternative to Mistral, but Dutch and Spanish helicopter carriers are as well. Trotsenko says OSK yards can build a helicopter carrier in 30 months for $500-700 million against a Mistral pricetag of €420-680 million. Kommersant concludes the tender won’t end the conflict between OSK and the Defense Ministry. Mistral will remain the latter’s priority. The paper’s sources don’t know if the military wants to buy Mistral itself or place an order for a new unit in a French shipyard (STX). OSK hasn’t been able to arrange a cooperative agreement with STX. Mezhprombank-controlled ‘Northern’ and ‘Baltic’ shipyards will participate in the tender according to a representative of the bank. Kommersant’s sources think Mezhprombank, its owner Sergey Pugachev, and shipyards are the favorites among Russian contenders. Pugachev was an early supporter of buying French, then building other units in his shipyards. And, according to Kommersant, the Defense Ministry supports Pugachev. Alongside Pugachev and Mezhprombank, OSK feels its chances to win the tender aren’t great. Moscow Defense Brief analyst Mikhail Barabanov also says Mezhprombank yards are the favorites to build Mistral in Russia. Such a deal’s been reached at a political level between Paris and Moscow, so the tender might just be a formality. CAST’s Konstantin Makiyenko agrees. But he thinks Mistral orders will go to ‘Baltic,’ since ‘Northern’ is loaded with frigate and corvette orders. Meanwhile, OSK would like to buy both yards from Mezhprombank, but the sides haven’t reached agreement on a price. This points up the bizarre circumstance in which Sechin is negotiating with the French, while his OSK subsidiaries complain about the potential deal. But, as Interfaks wrote on Wednesday, FAS says it lacks jurisdiction over the complaint from Yantar and Admiralty. FAS also says there’s no basis for a complaint since no deal for Mistral has been reached. The shipyards argue they’ve been excluded from bidding to build amphibious assault ships for the Navy, and the terms of the competition weren’t publicly announced. Their complaint seems to have merit since, from the outset, the Defense Ministry went directly after a specific ship and supplier, without issuing general requirements for a ship class. And, as Socor notes, talks continue also with the Dutch and Spanish [as Defense Minister Serdyukov has always pointed out] and now the possibility of a deal with the South Koreans has been thrown in, further roiling the waters. Izvestiya yesterday said OSK President Roman Trotsenko sent a letter to Defense Minister Serdyukov proposing a review of the military’s plans to acquire Mistral. In its place, Trotsenko suggests building the South Korean Dokdo under license in a Russian shipyard. He says he can build it in three years, and more cheaply than Mistral by one-third. OSK has a joint production agreement with Dokdo builder Daewoo. The Defense Ministry insists Russian builders demurred when asked if they could build these ships. Izvestiya doubts Trotsenko’s offer is realistic given the lack of available Russian buildingways. But the paper concludes the appearance of the letter shows the struggle for the amphibious carrier contract isn’t over.